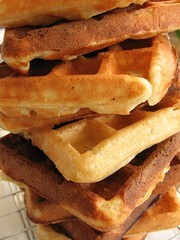 Buckwheat Yeasted Waffles - Do You Know The Muffin Man? Notes: The batter comes out very thick. I got fourteen 4" waffles out of this recipe. The buckwheat flour is barely noticeable (1:5 ratio with white flour). Not very crispy, as there's not much butter, but it does brown quickly.